To compare gait variability among older community-dwellers with and without fear of falling and history of falls, and 2) to examine the association between gait variability and fear of falling while taking into account the effect of potential confounders. Based on a cross-sectional design, 1,023 French community-dwellers (mean age ± SD, 70.5 ± 5.0 years; 50.7% women) were included in this study. The primary endpoints were fear of falling, stride-to-stride variability of stride time and walking speed measured using GAITRite® system. Age, gender, history of falls, number of drugs daily taken per day, body mass index, lower-limb proprioception, visual acuity, use of psychoactive drugs and cognitive impairment were used as covariables in the statistical analysis. P-values less than 0.05 were considered as statistically significant. A total of 60.5% (n = 619) participants were non-fallers without fear of falling, 19% (n = 194) fallers without fear of falling, 9.9% (n = 101) non-fallers with fear of falling, and 10.7% (n = 109) fallers with fear of falling. Stride-to-stride variability of stride time was significantly higher in fallers with fear of falling compared to non-fallers without fear of falling. Full adjusted linear regression models showed that only lower walking speed value was associated to an increase in stride-to-stride variability of stride time and not fear of falling, falls or their combination. While using a walking speed ≥1.14 m/s (i.e., level of walking speed that did not influence stride-to-stride variability of stride time), age and combination of fear of falling with history of previous falls were significantly associated with an increased stride-to-stride variability of stride time. The findings show that the combination of fear of falling with falls increased stride-to-stride variability of stride time. However, the effect of this combination depended on the level of walking speed, increase in stride-to-stride variability of stride time at lower walking speed being related to a biomechanical effect overriding fear of falling-related effects. Fear of falling (FOF), gait impairment and falls are common in older adults with a high prevalence estimated over 20%[1, 2]. They share the same risk factors such age, depressive mood and cognitive decline, as well as adverse consequences including activity restriction, increase in frailty and decrease in quality of life[3, 4]. 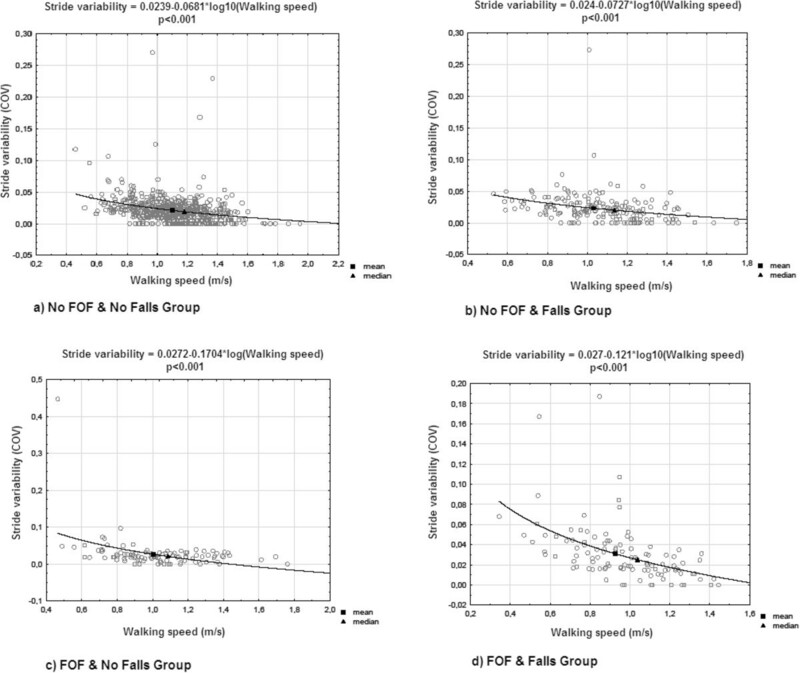 Because of a complex interplay between FOF, gait impairment and falls, less is known on the causal relationship between FOF and gait impairment in older adults. A better understanding on the association of FOF with gait impairment in aging population may be useful to appreciate the interaction between FOF and age-related changes in gait control, and to implement efficient prevention strategies of FOF. Gait impairment has been reported among older individuals with FOF[6–9]. Most of previous studies used mean values of spatial-temporal gait parameters and reported low gait performance including slower walking speed, shorter stride length and increased double support or stride width[6, 7]. FOF-related changes in gait performance are usually classified as higher-level gait disorders[8, 9]. It is now well established that gait variability defined as fluctuation of spatial-temporal gait parameters with time, is a biomarker of higher-level gait disorders[9, 10]. In particular, stride-to-stride variability of stride time (STV) - a measure of the reliability of lower limb movements - has been identified as a dependable biomarker of the rhythmic stepping mechanism depending on the highest-levels of gait control. Higher STV reflects an inefficient gait control and, thus, an unsafe gait. A limited number of studies have examined the association between FOF and higher STV, and have showed mixed results. Indeed, although some reported an association, others did not[2, 5, 8, 9]. We suggest that divergences previously reported are related to the effect of main confounders previously identified in the literature that may increase STV independently of FOF such as the age, history of falls, cognitive decline and low walking speed[10, 12]. Thus, the question is to determine whether FOF may independently influence or not gait variability among older adults. The aims of our study were 1) to compare STV among of older community-dwellers with and without FOF and falls, and 2) to examine the association between STV and FOF while taking into account the effect of some known potential confounders including walking speed. Between July 17th 2008 and April 3rd 2012, 1,023 community-dwellers were recruited in the French health examination center (HEC) of Lyon, localized in Eastern France, during a free medical examination. Exclusion criteria for the present analysis included age below 65 years, institutionalization, inability to understand and speak French, acute medical illness during the past month, diagnosis of dementia, extrapyramidal rigidity of the upper limbs (score above 2 on item no. 22 of the Unified Parkinson’s Disease Rating Scale motor score), severe orthopaedic diagnoses involving the lumber vertebra, pelvis or lower extremities (i.e., severe osteoarthritis and prosthesis) and inability to walk 6 meters unassisted. Baseline assessment included a full medical examination including information on age, gender and measures of height and weight. Body mass index (BMI, in kg/m2) was calculated based on anthropometry measurements (i.e., weight in kg and height in m). The number of drugs daily taken and the use of psychoactive drugs including benzodiazepines, antidepressants or neuroleptics, were also recorded. FOF was assessed using a single question: "Are you afraid of falling?" with a binary answer (i.e., Yes versus No). History of falls over the past year was recorded using a standardized questionnaire based on 22 items exploring the number, delay and place of falls (i.e., inside or outside the participant’s house), the evoked causes and circumstances of falls and all physical traumatisms. A fall was defined as unintentionally coming to rest on the ground, floor, or other lower level and not as the result of a major intrinsic event or an overwhelming hazard. Thus, falls resulting from acute medical events and/or external force were excluded from the analysis. Fallers were defined by the occurrence of at least one fall during the last year. Lower limb proprioception was evaluated with a 64 Hz graduated tuning fork placed on the tibial tuberosity. The mean value obtained for the left and right sides was used in the present data analysis. Distance binocular vision was measured at 5 m with a standard Monoyer letter chart. Vision was assessed with corrective lenses on if used by the participant. Depression was evaluated with the use of the 4-item Geriatric depression scale (GDS) score. A score ≥1 indicated the presence of depressive symptoms. Cognitive decline, and more precisely executive dysfunction, was considered when the clock drawing test was abnormal (i.e., one or more errors were made in the execution of drawing the face of the clock and/or the hands of the clock). STV and walking speed were measured at self-selected waking speed using GAITRite®-system (GAITRite Gold, CIR Systems, PA, USA) in a 6-meter corridor. The GAITRite®-System is an electronic walkway-integrated, pressure-sensitive electronic surface of 5.6 x 0.89 m that is connected to a personal portable computer via an interface cable. Participants walked one trial at their usual self-selected walking speed in a quiet, well-lit environment wearing their own footwear according to European guidelines for spatio-temporal gait analysis in older adults. Coefficient of variation (CoV) (CoV = (standard deviation / mean) x 100) of stride time was used to explore the outcome measure of STV. This study provides original information on the association of FOF with STV among older community-dwellers, highlighting that divergences previously reported on this association in the literature[2, 5, 8, 9] and in the present study mainly depend on the history of falls and the walking speed level. The latter parameter appears to play a major confounding role with a discontinued effect. This result is in concordance with the last published study on this topic, which underscored the hypothesis that walking speed could be a confounder in the relationship between high STV and FOF. Indeed, the association between STV and FOF was no longer significant after adjustment on walking speed in the present study. Our study provides more information on this specific effect of walking speed. The combination of FOF with history of falls was associated with an increase in STV only for a walking speed above 1.14 m/s. These results suggest that at lower walking speed, STV mainly depends on a biomechanics effect that overrides the effects of all other covariables and thus prevents exploring the association of STV with FOF. It has been previously reported that history of falls and FOF were independently related to an increase in STV. Our study underscores a new insight, which corresponds to a synergistic effect when FOF and falls are combined. Indeed, taken alone they did not increase significantly STV and the magnitude of effect was very low, but together they highly increased STV. This result is in concordance with Maki et al. who suggest this kind of interaction between FOF and falls. On the other hand, it has been previously reported that increased gait variability was a biomarker of falls. Numerous studies reported that fallers compared to non-fallers had higher gait variability[9–22]. In addition, it has been shown that higher gait variability may predict falls. First, the divergence with our results may be explained by the fact that we used a cross-sectional design, which is not best design to examine the causal relationship between two variables compared to cohort study design. Second, there could be a recall bias for falls assessment because it is well-known that a high proportion may forget the occurrence of falls, especially while the information on falls is retrospectively recorded compared to prospective collection of the event. Third, we used STV while other studies found association between higher variability of other spatial-temporal gait parameters and falls. It has been reported that there is a variation of the level of gait variability related to type of spatial-temporal gait parameter considered in healthy older adults with safe gait, the lowest value being reported with stride time and the highest with stride width. The second main result of our study was the fact that the effect of the combination of FOF with falls on STV depended on the level of walking speed. A significant association was reported only for faster walking speed (e.g., above 1.14 m/s). In contrast, for lower walking speed, the effect of combination of FOF with falls disappeared, and the increase in STV was related only to the decrease in walking speed. This effect is a well-known biomechanics effect. For instance, Beauchet et al. previously showed, while using a dual-task paradigm among healthy young adults, that the increase in STV was explained by the decrease in walking speed rather than an attention interference. This biomechanics effect was first underscored by Heiderscheit who showed that stride time variability was greater at very slow stride velocity (between 0.2 m.s-1 and 0.6 m.s-1) as compared with speeds ranging from 0.8 to 1.4 m.s-1 in a sample of older adults. Our results are similar with a higher threshold value. One explanation could be related to the age and the relatively good health of the studied population. It is important to note that the threshold walking speed of 1.14 m/s reported in participants with FOF and history of falls is close to the walking speed required for safely crossing street traffic signals in a community, 1.1 m/s. It may be suggested that for this group of individuals if their self-selected walking speed is above this threshold, the significant inverse association of walking speed and STV probably indicated their need to change their natural stepping rhythm in order to maintain dynamic postural stability. Whereas for those with a slower walking speed (i.e., under 1.14 m/s), the lack of significant association probably indicated that inability to adapt adequately their gait patterns. The clinical implication could be that the screening of walking speed is essential in this group of individuals. If their walking speed is above the threshold speed, then the screening of STV may also be necessary and in case of abnormalities early intervention could be properly initiated. A significant increase in STV related to the combination of FOF and falls at higher walking speed may be interpreted as a biomarker of the impairment of higher-level gait control. In terms of motor control, lower variability reflects an automatic process requiring minimal attention, whereas higher variability is related to major attention involvement. Dual task-related gait changes, which are used to study the involvement of attention in gait control, have highlighted that the control of spatial-temporal stride parameters may differ from one parameter to another. For instance, it was shown that healthy younger adults devoted attention to balance control under dual task conditions, whereas the control of the walking-related rhythmic stepping mechanism did not change. Both stride time and stride length variability are related to the control of the rhythmic stepping mechanism. Lower variability values reflect the reliability of lower limb movements and the automated regular rhythmic feature of gait and are associated with safe gait. Thus, an increase in STV due to the combination FOF with falls may be a biomarker of the impairment of higher levels of gait control. There were also some methodological limitations in our study. First, the cross-sectional design used in the current original study is not the most adapted to examine the association of FOF with STV compared to a prospective cohort study design. Second, FOF was recorded only with a simple question. Although this assessment of FOF is validated, a questionnaire with several questions would prove better and provide more information on the level of FOF associated with STV. Third, although we were able to control for many characteristics likely to modify the association between FOF and STV, residual potential confounders might still be present in our study. For instance, it could be suspected that individual’s physical activity level may influence STV. There is only few published data on the latter point. In 2005, we provided the first evidence while comparing stride time variability under dual-task condition between 10 healthy community dwelling older adults with long-term practice of Jaques-Dalcroze eurhythmics and 11 healthy controls without any particular exercise routine. No significant increase of stride time variability was found in the Dalcroze group with the interfering task of backward counting. In contrast, the healthy older subjects of the control group significantly increased their gait variability under dual task. In addition, all values of R-squared were small underlining that there was a large portion of variance of STV that was not accounted for confounders used in linear regression models. These low R-squared values also indicated that the strength of association was low between STV and tested dependent variables. Stride-to-stride variability of stride time.